photographing yourself/your style = narcissism? 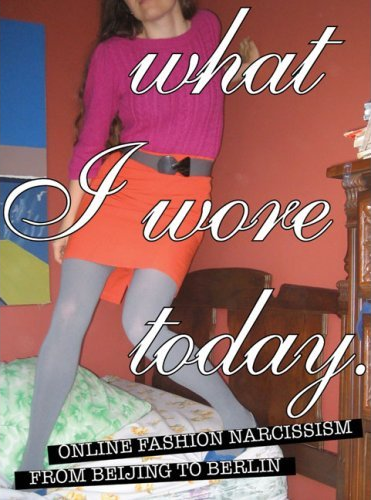 in a recent discussion in the wardrobe_remix forums, i learned about a soon-to-be released book, called what i wore today: online fashion narcissism from beijing to berlin. not knowing much about the project or it's tack/arguement (i wonder: is it celebratory, or critical? ), it seems that if nothing else, said book is focusing on the phenomenon of online fashion blogging/style sharing...you know, folks interested in fashion, photographing themselves and their outfits, and then sharing them with the world via their blogs, fashion forums, and communities or venues like wardrobe_remix (as well as other websites like w_r, of which i am sure many of you are familiar, net-and-fashion savvy as you are). i find use of the word narcissism in the title of this book curious (and frankly, a little odd). and it got me thinking...and questioning. the word narcissism*, at least to me, judging simply by its definition, has a pejorative connotation. i.e., it suggests that said sharing is judged to be a vice, something bad, something to perhaps be looked down at. that it is, at least in the eyes of some, vanity. do you feel that photographing oneself and posting that photograph in a public manner automatically and unequivocally implies narcissism on the part of the person posting said photo? is that person self-centered/self-obsessed? is that bad? is that okay? or is there another, alternative interpretation? do people share photos of themselves, or share photos of their outfits/style for reasons other than self-obsession, showing-off, or egoism? what's the point of sharing photos of oneself at all? why do we do it? why do do it, if you do? be critical, delve deep, divulge! another thought: would it be better, considered less ego-centered to not share photos of oneself at all? if photographing oneself can be argued as just being documentation of what one is wearing and not intended as a narcissistic act, would it be ethically better to keep the collection of said photos to oneself? does the mere act of posting those photos to be viewed publicly turn the photos into a self-centered, egocentric endeavor, one that's open to judgement? i'd love to hear what others have to say on this matter...particularly if you participate in websites like wardrobe_remix or focus on the documentation of your outfits in your own fashion blog.